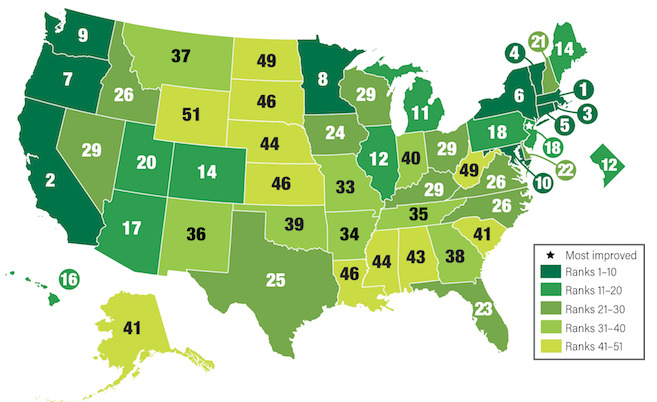 For the third year in a row, New Hampshire is ranked number 21 among the 50 states and the District of Columbia when it comes to energy efficiency. That’s according to the newly released annual scorecard of the American Council for an Energy Efficient Economy (ACEEE). Yeah, I know. State rankings are boring and notoriously subjective. Iowa is the most livable state in the country, according to U.S. News and World Report. Really? Who cares? The ACEEE applies considerable rigor to its annual report card. And if you are a utility customer with concerns about the high cost of energy in our cold-climate state, energy efficiency ought to be your holy grail. When you invest in it as an individual, you save money. When we encourage it, via ratepayer-funded efficiency programs, it is by far the cheapest resource there is for meeting the next unit of demand – less costly than coal, nuclear, wind or solar. Moreover, the Granite State’s disappointing record when it comes to energy efficiency becomes downright outrageous when you consider that we lag behind every other New England state. You literally have to go south of the Mason-Dixon Line to find a state with a worse ranking than ours. This is a problem not because southern states are less evolved than New Hampshire but because their mellower climates make energy efficiency less of an imperative than it should be here. Texas (ranked no. 25) can afford to be complacent because it is the Saudi Arabia of wind power and, if memory serves, they have some native fossil fuel resources down there as well. Nobody likes to compare New Hampshire to Massachusetts. So we will gloss over the fact that when you sit in the bleachers at Fenway Park watching Nathan Eovaldi of the Red Sox mow down the New York Yankees (as I did on August 4), you are also staring back at the top-ranked jurisdiction when it comes to ratepayer-funded energy efficiency. Let’s focus instead on more realistic comparisons – fellow minor-league baseball states like Rhode Island (home of the Pawtucket Red Sox, although moving to Worcester) and Maine (which hosts the Portland Sea Dogs). Last year, ratepayer-funded energy efficiency programs in Rhode Island saved more than 3 percent of the previous year’s retail electricity sales. The comparable figure for the Granite State? Just 0.71 percent. To get energy efficiency, you have to invest in energy efficiency. Last year Maine invested a sum equivalent to more than 2 percent of its electric utility revenue. The comparable figure for New Hampshire? Just 1.53 percent – nearly a quarter less. Two years ago, New Hampshire became the last state in New England to adopt an energy efficiency resource standard (EERS). In theory this commits us to all cost-effective energy efficiency, but in reality our goals lag behind our neighbors. This doesn’t seem right for a state whose new ten-year energy plan puts energy efficiency front and center in quest of savings for ratepayers. Like top-ranked Massachusetts, New Hampshire relies on our electric and natural gas utilities to deliver energy efficiency programs to customers after we all pay for them via special charges on our electric and natural gas bills. We’re nearing the end of Year 1 of a previously approved three-year plan for utility implementation of the EERS. Eversource, Liberty, the New Hampshire Electric Co-op and Unitil appeared before the Public Utilities Commission this week to begin the process of getting their annual energy efficiency plan update approved. If the utilities were expecting the Office of the Consumer Advocate to hold hands with them and sing “Kumbaya,” we shattered their illusions. The 2019 energy efficiency plan update leaves much to be desired. For example, the utilities are proposing a system benefits charge – that’s the way electric customers pay for energy efficiency – that is 17 percent lower than the one they agreed to for 2019 when the EERS was first approved (with the utilities’ agreement) in 2016. Some might find it ironic that the state’s ratepayer advocate would be arguing that a rate is too low. But that’s the equivalent of claiming a helium balloon defies gravity by floating upward. Ratepayer money spent on cost-effective energy efficiency displaces more expensive items just as helium is lighter than air. One such expensive item is costly upgrades to the distribution circuits that deliver electricity from high-voltage substations to our homes and businesses. Missing from the three-year plan, or the 2019 plan update, is any effort to geo-target energy efficiency projects in this fashion. Our neighboring states are adopting these so-called “non-wires alternatives.” So should we. Here’s another potential irony: It might be time to increase our electric usage overall, after years of efficiency-driven reductions. Though it was not as apparent even as recently as the launch of the EERS two years ago, so-called “beneficial electrification” is (as my kids would say) a thing. To put it another way, If consumers can save energy overall by switching from home and water-heating powered by fossil fuels to more efficient systems powered by electricity, their energy costs will go down even if their electric bills increase. But, again, this is not currently a priority for our last-in-the-region energy efficiency programs. Another factor contributing to our poor ranking on the ACEEE scorecard is New Hampshire’s insistence on sticking with an outdated version of the building energy code developed by the International Code Council. Regionally, only Maine is with us in holding onto the 2009 version of the code. This means new homes and businesses are being constructed to outdated standards. So new buildings leak more energy than they should, and costs are higher in the long run. Will New Hampshire’s ACEEE ranking improve in future years? Not unless we make some changes. The ACEEE has warned that in future years, states that artificially cap ratepayer-funded energy efficiency programs will lose ground. Such a cap is arguably what our Legislature imposed this year, by adopting House Bill 317. It precludes certain future increases in the system benefits charge, though the measure is vague and thus uncertainty is great. We will ask the Legislature to change course in 2019. We will prod the utilities to improve their plan in the meantime. Granite Staters deserve to live and work in a state that leads, rather than lags behind our neighbors, on energy efficiency.